It's out of the question that we would normally use a sedan to carry four to five passengers altogether, probably with some goods in the trunk. However, this isn't the case this time. Instead of carrying passengers and 'some' goods, this sedan - which I think is a Hyundai Accent or Verna - was forced to carry a massive amount of goods. 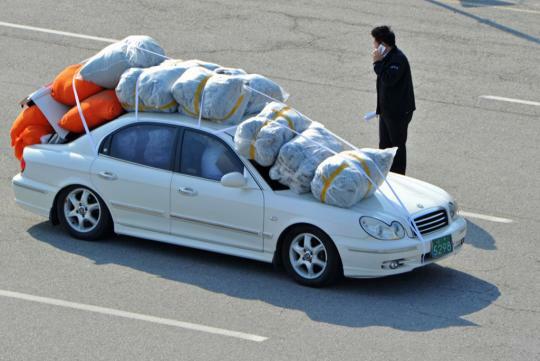 This sedan was seen being a carrier for massive goods last weekend on the Korean border, near Panmunjom, Paju. 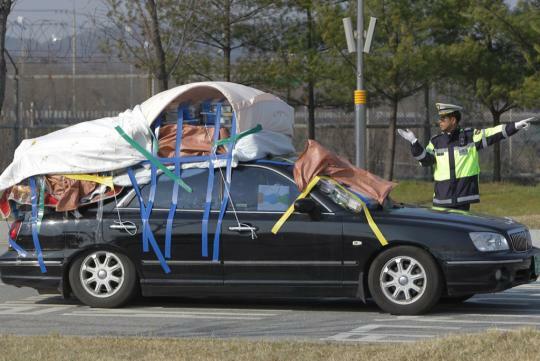 It was driven by a South Korean citizen trying to go back to his home country. 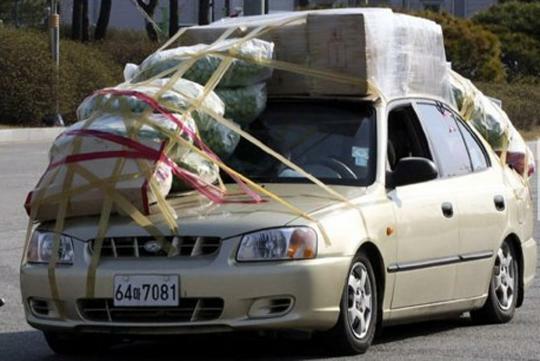 As you can see from the images, the goods nearly covered all parts of the sedan. The goods even nearly, if not completely, covered the rear windshield. How was the driver supposed to see when he needed to reverse the car then? The driver was reported to be previously working in North Korea. However, as we know, the rising tension between the two countries has forced all workers from South Korea to return home.  In total, there are 175 South Korean citizens that have been asked to leave North Korea. Most of those asked to leave previously worked in joint ventures of North and South Korea. Since they have to evacuate immediately, they have had to make do with whatever transport they can find. Well, it seems that the Hyundai in the image was just unlucky enough. However, it wasn't alone as there were also other sedans which received the very same fate. I wonder, though, if the suspensions of those sedans received any damage at all. You see, if the suspensions retain their good working conditions after reaching their destinations, these sedans might in fact be some of the strongest sedans automakers have ever built! Being a car enthusiast since his childhood, cars always make Richie Setiawan curious and want to find out more about them. Cars of those years have thicker steel. Try it on current generation ride, the outer shelf will dent first.